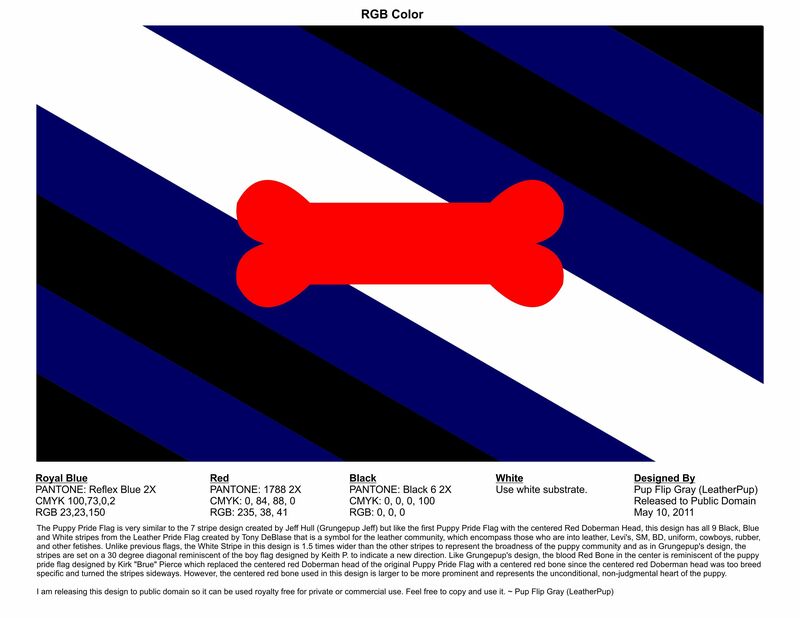 The Puppy Pride Flag is very similar to the 7 stripe design created by Jeff Hull (Grungepup Jeff) but like the first Puppy Pride Flag with the centered Red Doberman Head, this design has all 9 Black, Blue and White stripes from the Leather Pride Flag created by Tony DeBlase that is a symbol for the leather community, which encompass those who are into leather, Levi's, SM, BD, uniform, cowboys, rubber, and other fetishes. Unlike previous flags, the White Stripe in this design is 1.5 times wider than the other stripes to represent the broadness of the puppy community and as in Grungepup's design, the stripes are set on a 30 degree diagonal reminiscent of the boy flag designed by Keith P. to indicate a new direction. Like Grungepup's design, the blood Red Bone in the center is reminiscent of the puppy pride flag designed and strictly copyrighted by Kirk "Brue" Pierce which replaced the centered red Doberman head of the original Puppy Pride Flag with a centered red bone (he felt the centered red Doberman head was too breed specific) and turned the stripes sideways. 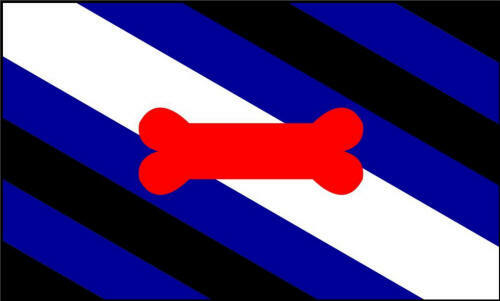 However, the centered red bone used in this design is larger to be more prominent and represents the unconditional, non-judgmental heart of the puppy. Click HERE to download the .PNG file only. Click HERE to download a ZIP file with all of the files. Click HERE to go to the Wikimedia Commons page. Click HERE to go to the Puppy Pride Flag Facebook page.